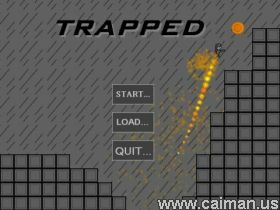 Caiman free games: Trapped by Kyle Thompson. You are trapped in the labratory of a mad scientist. Armed with a jetpack and and pistol, it is your job to blast, shoot, and navigate your way out of his domain. It is this exciting storyline combined with the huge variety of levels, obstacles, enemies, bosses, etc. that really make this game the great production it is. Complimented with great graphics and fitting sound effects, it also has a unique physics system. Although highly unrealistic, the gravity combined with trampoline walls gives quite a solid challenge. You control the player using lunar lander type controls and shoot using the spacebar. The downside is that the real difficulty you face is the clock. This can be infuriating as you try time and time again to beat the seemingly insane time limits to pass the level. However, this is made up for by exciting boss challenges and huge diversity between each new level. Overall, its a very well done production that could use a little more work on the difficulty levels.